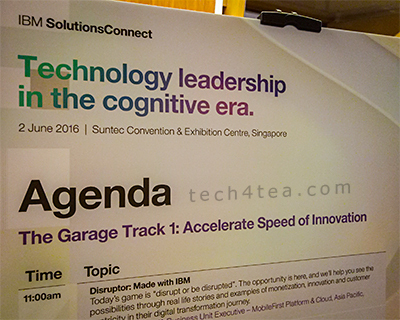 IBM SolutionsConnect: Garage Track 1 – Accelerate Speed of Innovation « Tech bytes for tea? “Microservices solve the problem of different teams working on different projects at different speeds. They allow IT teams to continue running like ‘Steady Eddies’ but let digital teams innovate and create new offerings,” said Brett Michael Nulf, Business Unit Executive for MobileFirst Platform & Cloud, Asia Pacific, IBM Corporation. You begin with the functional decomposition of monolithic systems into independent processes, focusing on doing one thing well at a time, and structured around a business domain. Systems become less vulnerable to widespread outages and are able to evolve incrementally over time. Nulf described the evolution of APIs, which included System APIs and Interaction APIs. System APIs pass through data from a system of record unchanged; while Interaction APIs invoke one or more System API’s or data sources, and manipulate the returned data with new logic – promoting reuse across new applications. Such decomposing of complex systems through the use of Node.js leads to lower IT costs, as experienced by LinkedIn, Walmart and AT&T Innovation. Online retailer Gilt managed to improve productivity of its development teams which developed more than three hundred Microservices – since adopting the new approach, the number of services per engineer tripled, according to Gilt’s CTO, Michael Bryzek. Agility and speed of feature updates also jumped. Node.js also enabled faster response times for interactive services, as experienced by PayPal. Nulf shared that IBM offers a complete cloud platform for digital transformation – based on IBM API Connect, IBM MobileFirst and IBM Hybrid Cloud. Together, these ensure quality, rapid development, hyper-contextuality and cognitivity. API Connect connects all stages of the API lifecycle – involving the Create, Run, Secure and Manage stages – promising an unparalleled, integrated user experience. MobileFirst Foundation provides a simple, scalable and proven enterprise mobile middleware deployable on-premise or in the Cloud – offering the following benefits. Comprehensive Security – to protect from mobile-specific threats. App Lifecycle Management – to reduce time and costs of operations and incremental updates. Mobile Analytics – to better understand your users. Backend Logic Engine – to add server-side logic to your app. Push and Offline Sync – essential backend services that every app needs. Create – build new cloud native mobile or web apps with high productivity. Connect – connect to cloud services and publish apps or data to the cloud. Optimise – Move or burst workloads to the cloud. This entry was posted on Thursday, June 2nd, 2016 at 8:00 pm and is filed under App, Business IT, Cloud, Enterprise IT, Events, events, IBM, Opinion, Reference, Seminars, Software, software, Wiki. You can follow any responses to this entry through the RSS 2.0 feed. You can leave a response, or trackback from your own site.